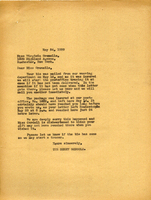 A letter to informing Miss Grenelle that her package of a tie being sent previously, and telling her that if she has still not received it on getting this letter, the Berry Schools weaving department will send her another one. 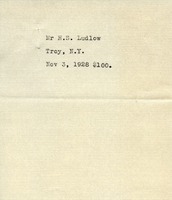 The Berry Schools asks the Fifth Avenue Bank for the address of Mr. W. L. Jones so they may send a receipt for his recent check. Receipt No. 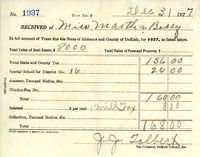 32528 for donation to the Berry Schools of $1.00 by the United Daughters of the Confederacy. 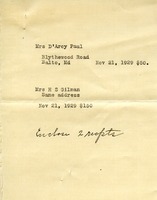 Receipts for checks from Mrs. D'Arcy Paul and Mrs. H. S. Gilman. 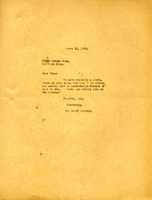 This letter was addressed to Mr. Henry Ford from the Berry Schools. 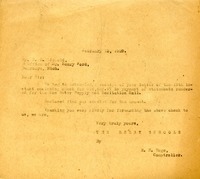 The letter is a receipt as well as a letter of gratitude for Mr. Ford's help and generosity towards the schools.